This three-dimensional map offers a first look at the web-like large-scale distribution of dark matter, an invisible form of matter that accounts for most of the Universe's mass. This milestone takes astronomers from inference to direct observation of dark matter's influence in the Universe. Because of the finite speed of light, regions furthest away are also seen as they existed a long time ago. The map stretches halfway back in time to the beginning of the Universe. The map reveals a loose network of dark matter filaments, gradually collapsing under the relentless pull of gravity, and growing clumpier over time. This confirms theories of how structure formed in our evolving Universe, which has transitioned from a comparatively smooth distribution of matter at the time of the big bang. The dark matter filaments began to form first and provided an underlying scaffolding for the subsequent construction of stars and galaxies from ordinary matter. Without dark matter, there would have been insufficient mass in the Universe for structures to collapse and galaxies to form. [Top] - Three slices through the evolving distribution of dark matter. The dataset is created by splitting the background source galaxy population into discrete epochs of time (like cutting through geologic strata), looking back into the past. This is calibrated by measuring the cosmological redshift of the lensing galaxies used to map the dark matter distribution, and binning them into different time/distance "slices". Each panel represents an area of sky nine times the angular diameter of the full Moon. Note that this fixed angle means that the survey volume is a really a cone, and that the physical area of the slices increases (from 60 million light-years on a side to 100 million light-years on a side) from left to right. [Bottom] - When the slices across the Universe and back into time are combined, they make a three-dimensional map of dark matter in the Universe. The three axes of the box correspond to sky position (in right ascension and declination), and distance from the Earth increasing from left to right (as measured by cosmological redshift). Note how the clumping of the dark matter becomes more pronounced, moving right to left across the volume map, from the early Universe to the more recent Universe. 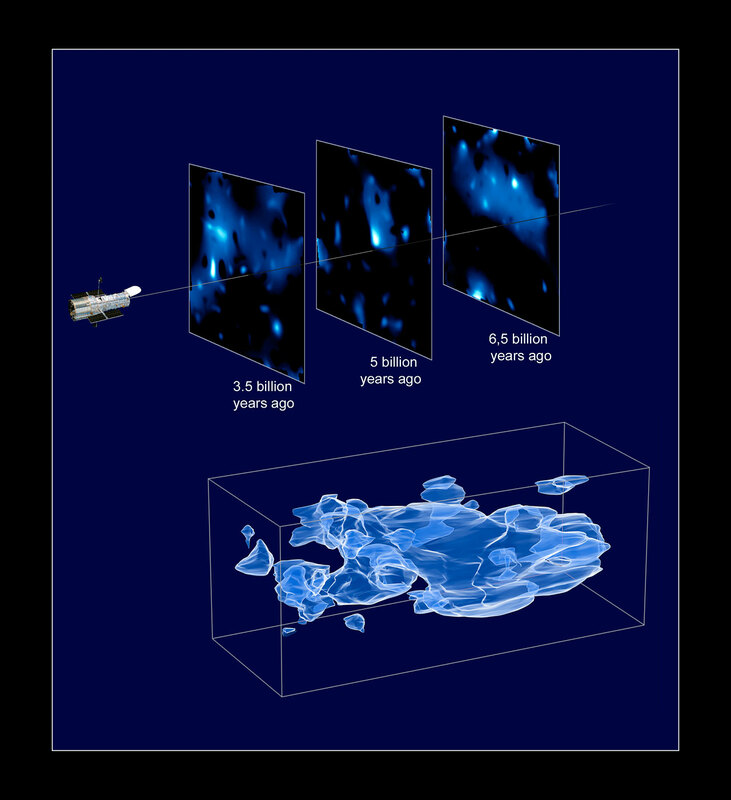 The dark matter distribution was mapped with Hubble Space Telescope's largest ever survey of the Universe, the Cosmic Evolution Survey ("COSMOS"). To compile the COSMOS survey, Hubble imaged 575 adjacent and slightly overlapping views of the Universe using the Advanced Camera for Surveys' (ACS) Wide Field Camera onboard Hubble. It took nearly 1,000 hours of observations. The distances to the galaxies were determined from their spectral redshifts, using ESO's Very Large Telescope, the Subaru and CFHT telescopes in Hawaii and the Magellan telescope in Chile.